A few years ago, my wife and I were returning from the grocery store in Savigné-sur-Lathan, just a few miles from our summer home in the Loire Valley. The radio was playing and I remember hearing a beautiful piano solo that was totally unfamiliar to me. Once we arrived in front of our home, I remained in the car for an extra minute or two, hoping to catch the name of the composer and the lovely composition. When the piece ended, the announcer identified the composer as Georges Bizet, and the composition as Nocturne No. 1 in F Major. I was vaguely aware of Bizet’s Nocturne in D Major, but was unaware he had written more than one nocturne. When we returned home to the states soon after, I started searching for the sheet music to the nocturne, but was unable to find any place where it was available. 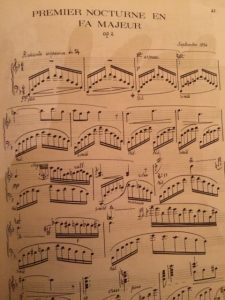 There were a few recordings of the piece, but all my attempts at finding the piano music ended in vain. It remained in the back of my mind, however, and one day I discovered a recording of the nocturne online. As I read comments from listeners to the online recording, I discovered a response to a query indicating that the sheet music could be obtained from a small publisher in Paris. I immediately accessed the publisher’s website (BMB) and ordered the music. It took a couple of weeks to arrive, and when I opened the book I was surprised to see that the composition was “handwritten,” in exceptionally clear writing—very easy to read. I was intrigued that the piece was labeled “Opus No. 2,” meaning it was just Bizet’s second composition ever written. I played through the piece the first time and felt as though I was listening to a voice from the past. In a way, I was; the piece had been composed in 1854, when Georges Bizet was only 18 years of age. Bizet, of course, is widely known for his romantic opera, “Carmen.” But, he was also an exceptional pianist. 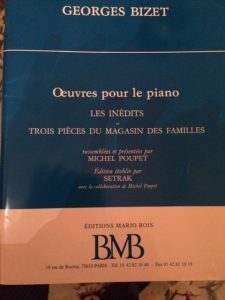 The introduction to the publication explains how after Bizet’s tragic death at age 36, a large number of works were discovered in his home; some at or near final form, others were works in progress. Among them was the Nocturne in F Major. It took a herculean effort to edit the completed piano pieces, which the editor indicates fittingly, have now come from out of the shadow. 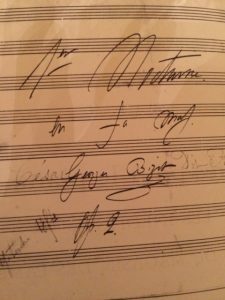 The publication also contains a handwriting specimen of Bizet, where he identifies the nocturne. Upcoming Concert: Please Join Me! I have had the pleasure to become better acquainted with Bizet’s lost nocturne, as I study it in preparation from the Book Lecture/Concert which will occur at the Carlsbad City Library on Sunday, November 13 at 2:00 p.m. (I have the Amateur Pianists of San Diego to thank for sponsoring this event.) During the concert, I will be playing some of the compositions featured in my historical novel, “Forever Gentleman,” including this nocturne. I assume it will be the first time any present have heard this hauntingly lyrical piece. I hope many of you reading this blog will be in attendance and enjoy being transported back into time and discovering music from a bygone era. See you there.